The above photograph is a detail from a picture postcard, already quite old I think, that I bought in Zakopane, Poland, in 1977. Note the fiddler plays on a small kit-like instrument and that the bass is lozenge shaped and has three strings. The fiddle and bass combination is common in the music of Eastern Europe including Romania and Hungary and was once known in Scotland also – think of those paintings of Niel Gow band. The benefit of this grouping for dance music is obvious, and once more there may be clues to how traditional music in Scotland once sounded waiting to be discovered in other cultures that employed it. I cannot recommend this website highly enough for anyone interested in the pre-violin and folk-violin bowed instruments. The sheer variety of fiddle types is mind boggling, the website is beautifully designed and the sound recordings and videos are a delight and must surely hold clues to what might have been heard in Scotland. But don’t take it from me – spend some time there now! By the 17th century, it is estimated that there were at least 30,000 Scots living in Poland. Krakow was one of the main cities in which they settled, and in 1576, the Scottish community in Krakow was large enough that Poland’s King Stefan Batory, assigned a district of the city for them to settle in. Given Scotland’s trading and military links with Poland from the mid-sixteenth century onwards and the great number of Scots who went there, could instruments have come to Scotland that way? I made a trip to the National Museum of Scotland to look at a couple of woodcarvings that are a key part of the very limited iconography of the early bowed instruments in Scotland. These items have been employed by writers on Scottish music to support the suggestion that there was a pre-violin fiddle tradition. This Picassoesque carved relief, perhaps from Threave Castle, Kirkcudbrightshire, and from the late 1500s, shows a violin bodied instrument with a long neck played horizontally from the upper arm. There appears to be a projecting terminal where the scroll is expected. It has been suggested that the subject (and the accompanying bagpiper and dancers) are minstrels, i.e. professional entertainers, and links to Atlantic Spain have been postulated. In this mid-sixteenth century carving associated with Perthshire the putto is more symbolic rather than real, as found extensively in drawn and painted art throughout Europe although the bells and ribbons around his knees do suggest jolly, musical fun. The musician is playing a rebec-like instrument of three strings, again in a horizontal fashion. The fingers of his left hand do not quite meet the strings – is it possible that the player is using the finger nail, side pressure technique found in Crete, Bulgaria, Poland and elsewhere as discussed in previous posts? After months of searching I have now traced the above image of the great man that I had seen some time ago. I never thought to search for it under the spelling Neal. The image is by J Jenkins and is published by the National Library of Scotland in its Digital Gallery [http://digital.nls.uk/84254289, shelfmark Ry.II.b.16] under a Creative Commons Non-commercial ShareAlike 4.0 International licence. In a previous post I mentioned and reproduced the mezzotint of Raeburn’s famous portrait of Niel Gow published in 1816. Here is a little bit more. This ‘memorail portrait’ print was prepared by William Say in 1814 and published in 1816 by T. Macdonald of 39 Fleet Street, London. It is assumed that it was the engraver’s plates for the mezzotint that were donated to the British Museum rather than those for the new Gow collection. The museum certainly has a copy of the print (1852,1009.1285) but this was donated in 1852 by the engraver’s son Frederick Richard Say (fl. 1825-1860) who was also a printmaker. I wonder if the engraver’s plates still exist. A bit closer to home now. There has been something of a mini fiddle revival in Poland of late led by the enterprising musician Maria Pomianowska who has worked with organologists and luthiers to devise and play various ‘new’ instruments of the fiddle family based upon museum examples and iconography. See also this site. At least one of her revived instruments relies on the fingernail method and it has been suggested that the Pollish models might be the missing link between the instruments of the east and of times before the modern violin. The resulting instruments are certainly fascinating and the sounds endearing. Might this be how Scottish fiddle music might have sounded. Did the Scots play similar instruments? With the fingernail method? Why did the Scottish fiddle revival not go down this route? Should we play them now? Has the train already left the station? During my Erasmus+ visit to Bulgaria last week I failed to hear any live gadulka playing due to the busy schedule. Nevertheless, I did encounter the instrument in a number of museums (below) and even on brooches in souvenir shops (above). What became clear is that the gadulka comes in a number of different flavours in terms of name, size, strings (some have sympathetic strings as well as the standard three), and tunings, although one form is now the standard. I read in Grove that the first (highest) string is played by touching its side with the finger nails (as with the Cretan lyra) and that the other two strings are pressed from above but not right down to a finger board. 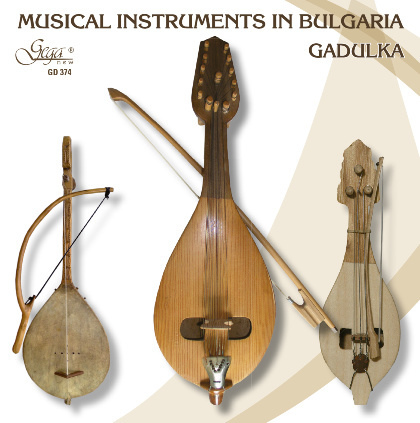 I picked up a great CD called Musical Instruments of Bulgaria – Gadulka which has some interesting, if sometimes fanciful, liner notes. I’ve made a selection of my three favourite tracks using Spotify. In each it is possible to imagine how Scottish traditional music might sound on the instrument – I think it would be highly viable. Dobroudjanska Ruka is popular dance (see it danced on YouTube). It is played here by gadulka, bagpipe and accordion in unison. The slow tunes in the other two tracks remind me somewhat of the playing of Irish maverick fiddler Tommy Potts, which I love. Mincho Nedyalkov’s final jig would not be out of place as a theme in a Celtic Connections New Voices commission.